Just when I thought we were done with these, but then Blizzard revealed a new character for Overwatch. A new character means a new video preview—an unedited match showing how they'll play in-game. That character, in case you hadn't worked it out from the headline, is Lúcio. Supposedly, he's an "international celebrity who uses his music to change the world for the better." The better, in this case, seems to mean murdering a whole bunch of dudes. 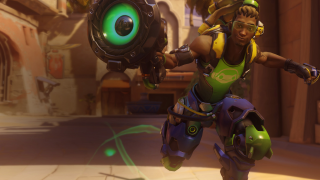 Lúcio is a support character, and that's definitely not a Dubstep Gun he's carrying. Rather, it's a 'Sonic Amplifier' which fires out painful projectiles, and can knock enemies back with a blast of soundwaves. It also outputs two 'songs', one of which increases speed, the other regenerates health. His ultimate gives a temporary shield effect to himself and his allies. As I've written multiple times at the bottom of these posts, Overwatch is due to hit beta before the end of the year. Recently, the game appeared on the Battle.net launcher—not that you can do anything with it at the moment.